Nick Ross has won the first race of the weekend at Round 5 of the BNT V8s in a thrilling encounter at Manfeild Circuit Chris Amon today at Feilding. 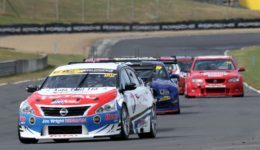 Starting from position two, Ross and his Nissan Altima gained a good start and held the lead into the first turn from a hard charging Championship leader Jack Smith. Smith looked to have speed and performance on Ross under brakes and into turn one, Smith almost made a passing move stick on lap ten, until Ross fought back and held the position. 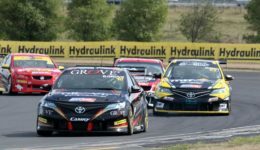 Behind the leaders there was drama as Chelsea Herbert’s race came un stuck when she and her Toyota Camry spun off on her own, nearly ending up in the tyre wall on the outside of the last corner. Brenton Grove also struck trouble when he got loose on corner exit, went wide onto the grass, and lost a spot to Lance Hughes. There was further drama for Grove when he copped a hit from Brad Lathrope on lap three. Grove ended up in a spin and facing the wrong way while Lathrope went off and onto the grass. Meanwhile, at the front and by the end of the 14-lap encounter Ross had managed to hold on to win, with Smith finishing second and Lance Hughes finishing third. The Holden of Rob Wallace finished in fourth place, with Australian Brenton Grove finishing fifth in his Toyota Camry. “We put new brake callipers on the car at the start of the season. Since then we haven’t been able to find the balance set up on the car. We changed back to the old ones and it seems to have paid off with better balance set up in the car now. Class Two was one by Matt Podjursky who finished ahead of his rival Justin Ashwell. “Great work by the team to get a fast car out on track for me,” said Podjursky. 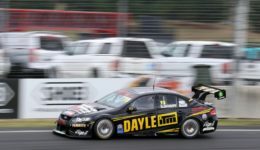 The BNT V8s have two more races at Manfeild tomorrow.